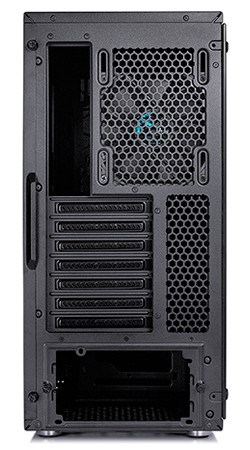 There is so much commonality between PC chassis that it can be difficult for any one manufacturer to stand out from the crowd. 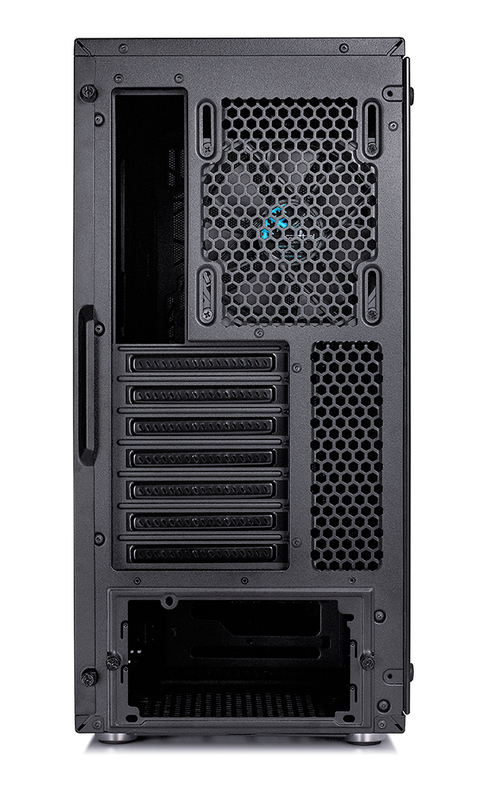 Swedish outfit Fractal Design has managed to carve out something of a niche by putting forth an array of cases that offer the mix of simplicity and functionality you come to expect from Scandinavian design. The firm's Define Series has proven particularly popular, but the staid aesthetic and white accents aren't for everyone. 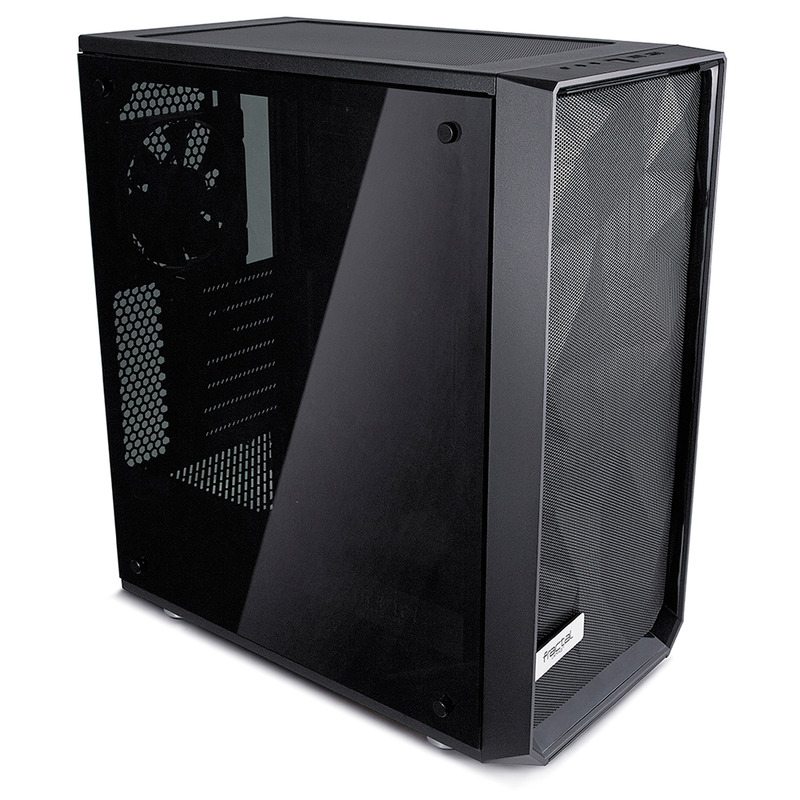 In an effort to jazz-up its portfolio, Fractal has recently added a tempered-glass option to its mid-range Define C, and is today expanding the product line with the introduction of the Meshify C.
Priced at £80, Meshify C costs the same as Fractal's existing Define C and Define S solutions, but hopes to target a fresh audience via "a defiant new look" that the manufacturer claims is its most aggressive to date. 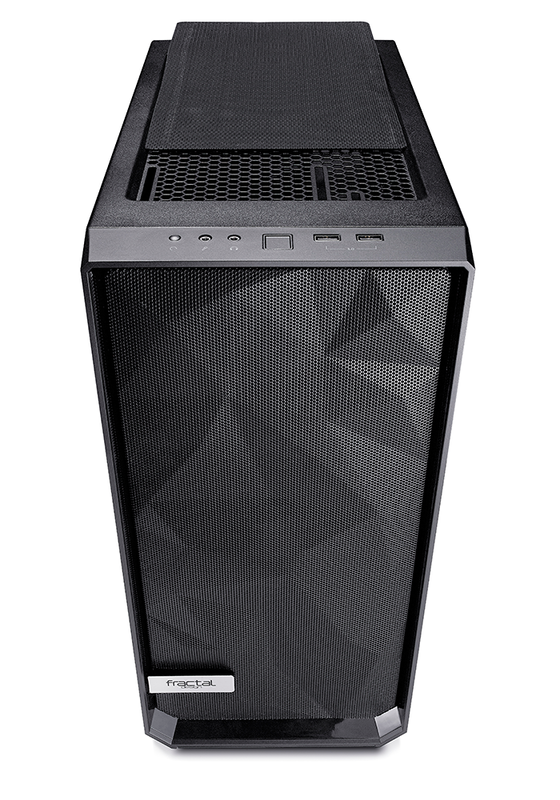 Gone are the signature white highlights and simple-looking front panels, with Fractal instead opting for an all-black aesthetic and an angular mesh front cover that looks quite trendy in the flesh. 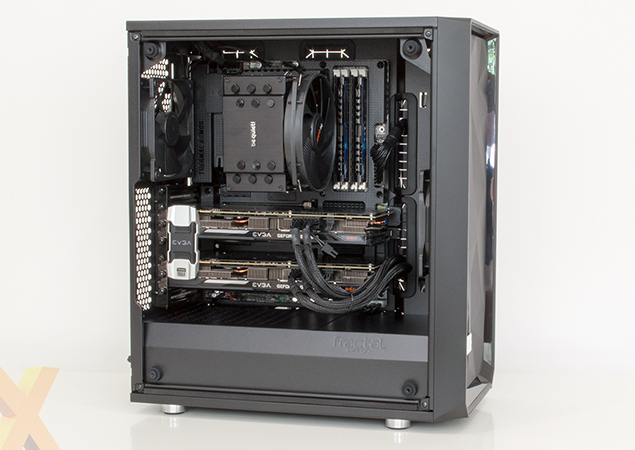 This is, in our estimation, the most fun-looking Fractal Design chassis to date. 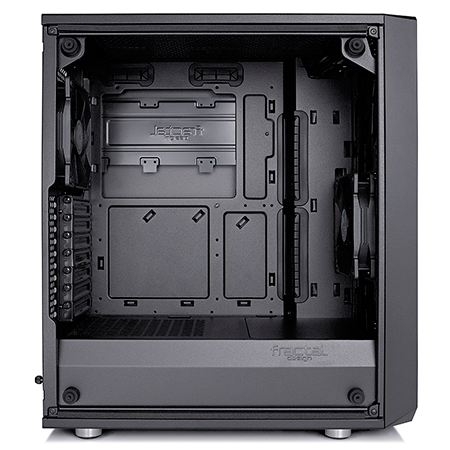 The silver brand logo on the front panel is a nice touch, the tempered-glass side panel is well-sized, and though it protrudes a tad rather than sit perfectly flush, we like the fact that it is tinted dark enough to add that element of mystery. You'll need a couple of internal LEDs should you wish to show off your hardware to full effect. Build quality, as you'd expect, is decent throughout, but while the exterior may lead you to believe that this is an all-new Fractal enclosure, the interior will leave you with a sense of déjà vu. 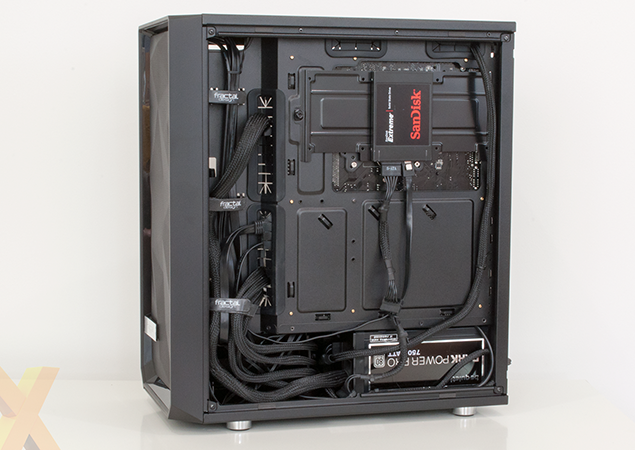 This is because Meshify C is essentially last year's Define C with a new skin. Dimensions of 217mm (W) x 453mm (H) x 413mm (D) are practically identical, and so too is the arrangement of top I/O ports, which include a pair of audio jacks, reset and power buttons, as well as a couple of USB 3.0 ports. USB 3.1 Type-C is, however, sadly still conspicuous by its absence. The interior is neatly arranged for a modern-day build, but it's a shame Fractal hasn't taken the opportunity to expand on the existing feature set. 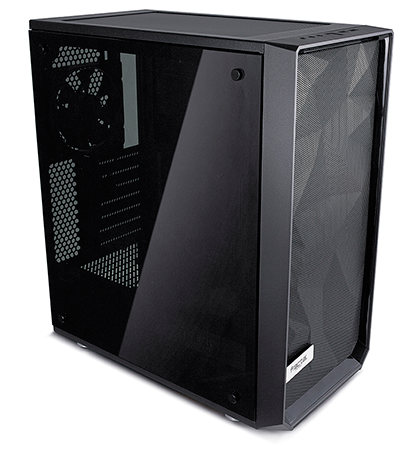 The aesthetic alterations are easy on the eye, and the tempered-glass panel is likely to serve as a key attraction, but Meshify C actually loses one key feature available to the Define C upon which it is based; there is no sound-dampening material lining the rear side panel. Noise levels, then, are likely to be a fraction higher than its Define sibling, but Meshify C is almost certain to deliver lower temperatures. 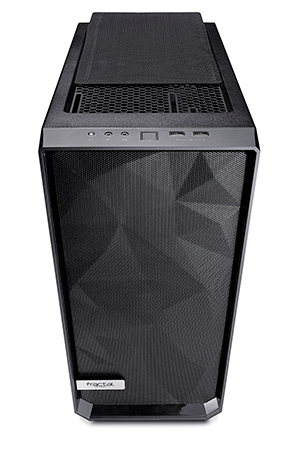 There's no longer a ModuVent on top, with Fractal reverting to a magnetic mesh filter, and the chassis' perforated front panel is well-suited to maximum airflow. Just the two Dynamic X2 GP-12 three-pin fans are included as standard - a front 120mm intake and a rear 120mm exhaust - but there's plenty of room for expansion. Supported mounting locations include two 120/140mm up top, 120mm at the rear, 120mm at the bottom and either three 120s or dual 140s in the front. CPU coolers can measure up to 172mm in height, while graphics cards can extend to 315mm, and for liquid-cooling configurations there's room for a 120/240mm radiator in the ceiling, or a 240/280/360mm radiator behind the front panel. 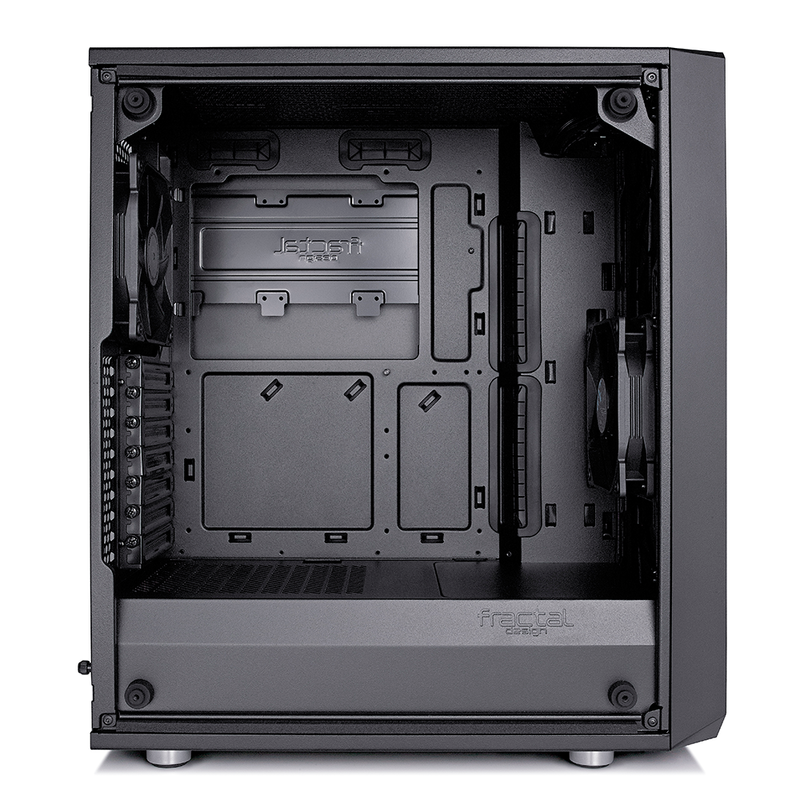 You will need to remove the dual-bay hard-disk cage that sits at the end of the shrouded PSU compartment in order to install a full-size front radiator, but it isn't hard to put together a high-end platform that looks the part. Room behind the motherboard tray is at a premium, yet the Velcro tabs in the recessed column do a stellar job of managing cables, there's space to line-up a trio of SSDs on the removable tray, and the hinged side panel is simple to secure via captive thumbscrews. Keeping the PC clean shouldn't be a chore, either. A full-length filter lines the bottom of the case and slides out conveniently from the front, the top magnetic mesh cover is easily removed, and though the front mesh section would benefit from a push-to-release mechanism, it comes away with a strong tug.